In market heaven!! | Hand Luggage. The Chiang Mai Sunday walking market. I am in heaven, Neil may have found his own personal hell. . . . The start of the epic four hour market trek. Neil still looks chipper at this point. The market stretches the length of Th Ratchadamnoen from Pratu Tha Phae to Wat Phra Singh as well as heading off down side streets too. A legion of smiley nut jobs (just incase you fancy one). Unusual drink flavours in bamboo containers. The roselle is a species of Hibiscus. In Thailand, Roselle is generally drunk as a cool drink, but also as a tea, believed to reduce cholesterol. It can also be made into a wine. I have no idea what Bawbk is! A multitude of fizzy drinks presents a multi-colour wall of refreshment for the weary shopper. Beautiful cloth begs to be taken home. Bagging up a variety of unidentifiable food stuffs. Nuts, pulses and other dried ingredients wait for savvy shoppers. Below a vendor prepares sweet treats. In the background the pink and green items are a popular dessert – Salim. 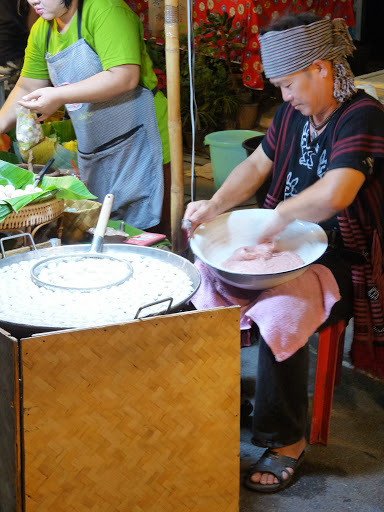 It is a traditional Thai dessert sweet of multi-coloured mung bean flour noodles or threads, usually served topped with sweetened flavored coconut milk and served over crushed ice. The noodles are made fresh daily by pressing the cooked mung bean flour dough through the tiny holes of a salim press into a bowl of cool water. Above fresh fruit is ready to be juiced. Thailand is a cornacopia of colourful, mouthwatering edibles, from exotic dragonfruit to Mangosteen, Rambutan, Jackfruit and Lychee. There’s also the revolting smelling Durian. 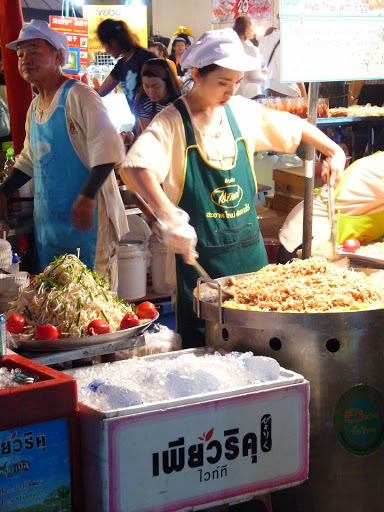 The temples along the way have food stalls selling northern Thai cuisine. The market is extremely popular and gets uber crowded, so arrive early. If you’re not in town on Sunday there is also a Saturday Walking Street.